Shrubbery Recommendations for Screening - Richard Lyons Nursery, Inc.
With winter quickly receding into the background, we turn our attention to a subject of perennial interest: how to develop foliar barriers. You may want to cover up a fence or a building, create the illusion of size by installing circuitous pathways, or simply enhance privacy. In our subtropical world, there are many species that help achieve those goals. Here’s a survey of a just a few of the choices available for those purposes at Richard Lyons’ Nursery. 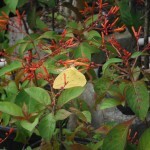 Hamelia patens (Firebush): H. patens is a native shrub that is remarkably amenable to various soil types, from the alkaline rockland of southern Florida to the deep acidic soils of the temperate South. It flowers best in full sun, but performs well even in some shade. The species is reasonably drought-tolerant, but can handle plenty of water, so long as good drainage is ensured. Once established, it is quite easy to maintain; cutting it back periodically will promote compactness and encourage blooming. And it doesn’t even require much fertilizer! 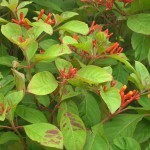 Firebush has a huge native range, from north central Florida and Bermuda in the north through the Caribbean, Mexico, Central America, and into Paraguay in the south. 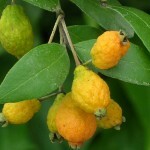 In southern Florida it is a semi-woody evergreen shrub or small tree that reaches about 12 ft. high. Its leaves are oval to elliptical, up to 6 in. long, featuring reddish veins and leafstems. It produces clusters of ¾-in. red-orange or scarlet tubular flowers throughout the year. Its berries are also attractive, developing through a range of colors from green to yellow to red to glossy black. In the ground, Hamelia can be used as a solid hedge or can be mixed with other materials, but it can also be featured to great advantage as a stand-alone specimen. It is quite popular in hummingbird and butterfly gardens. 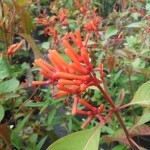 In colder locations that experience a distinct winter, Firebush makes an outstanding container plant that can be brought indoors and kept in a bright location until the return of warm weather. 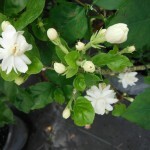 Jasminum sambac (Arabian Jasmine): This popular species, while native to a confined region of the eastern Himalayas, has become naturalized in many places around the world, due largely to its very nice fragrance. 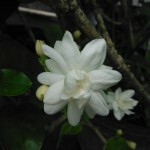 In fact, the flowers are the source of an oil which is incorporated in perfumes and Jasmine tea. Somewhere along the way it took on the common name Arabian Jasmine, but that is misleading, since it does not like arid climates. It grows as a small, informal shrub or vine, with glossy, dark green leaves, and matures somewhere between 1½ and 10 ft. in height. It bears sweet-smelling waxy white flowers about an inch across. The cultivar ‘Grand Duke of Tuscany’ is especially appealing, since its blossoms grow as doubles which resemble miniature gardenias. J. sambac performs well in sunny to partially-shaded exposures. It likes abundant water, provided that there is also good drainage. Once cooler weather arrives, its moisture requirements diminish. 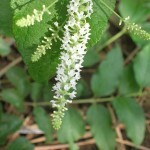 Aloysia virgata (Sweet Almond): Plant lovers appreciate the vast array of fragrances encountered in tropical and subtropical species. 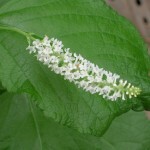 One of the best of them introduced to our region is the Sweet Almond, Aloysia virgata. 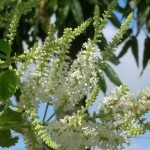 Its strong fragrance is optimally enjoyed at a distance from the plant, where breezes easily carry it. Native to fairly dry subtropical areas of Argentina, Sweet Almond can be grown in the ground all the way into Climate Zone 8, where it is treated as a perennial. But in southern Florida, it is an evergreen capable of reaching 15 ft. in height. 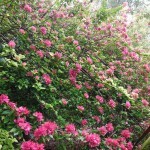 It has an upright, informal habit with some horizontal branching, and is amenable to hard pruning for owners preferring to maintain it as a shorter shrub. A. virgata blooms in flushes on and off most of the year with spikes of tiny white flowers. The leaves are dark green to gray-green and feel sandpapery to the touch. Happily, the plant is not very demanding. It tolerates average soils and, once established, is sufficiently drought-tolerant to perform well in a xeriscape. Sweet Almond provides more than just an appealing fragrance, as it also attracts bees and butterflies. In particular, it is popular with the Atala Butterfly, Eumaeus atala, which is still in recovery from near-extinction. 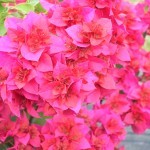 Bougainvillea spp. 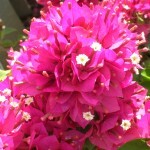 (Bougainvillea): Maybe you’ve noticed lately that knowing what is true has become rather elusive. For instance, can both of the following statements be true? 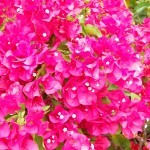 (1) Bougainvillea is one of the most colorful vines in the world. 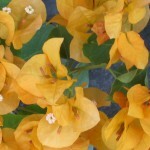 (2) The flowers of Bougainvillea are small and inconspicuous. The answer is yes. That’s because the features that produce the spectacular colors found in this genus are actually bracts, modified leaves located at the point from which flowers develop. Thus bracts are an integral part of the flowering process, though they are not flowers themselves. 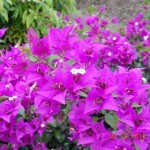 There are over 300 cultivars (cultivated varieties) of Bougainvillea! Plants produce sprawling, arching branches, but can be trained to grow as a standard. Often used in the ground as an impenetrable screening material, it can also be grown in containers or hanging baskets where pruning following bloom will keep the plant compact and encourage side-branching. And as a container specimen, Bougainvillea is particularly amenable to thriving on high-rise balconies, because it is very resistant to winds. Although not extremely cold-hardy, the genus can stand enough frost to be widely grown as an ornamental in southern Switzerland near the foot of the Alps. The best color production occurs in full sun. The genus is highly salt-tolerant, so coastal exposures are no problem. 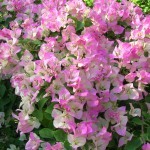 Bougainvillea is also quite drought-tolerant, and once a plant installed in the ground becomes acclimated, it will require little supplemental watering. 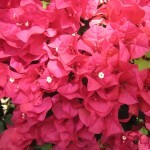 In fact, the very rainy and hot summers of southern Florida inhibit color displays, so in our region Bougainvillea flourishes best during the dry season. It responds well to light applications of fertilizers, but use of a high-nitrogen formula will produce rampant vegetative growth without much color. A balanced formula is a better bet, and some experts recommend fertilizers formulated for roses or other flowering plants. The cultivar ‘Pixie’ deserves special mention. Not only is it almost thornless, but it also produces color later into the summer than many other cultivars. 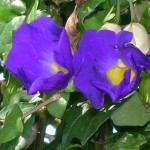 Thunbergia erecta (Bush Clock Vine or King’s Mantle): Here is yet another plant recommendation that adds color on the purple and white side of the palette to the parts of your garden where lighting is muted. Thunbergia erecta, a native of western Africa, is a woody shrub that reaches about 6 ft. high and wide, bearing small glossy green leaves. 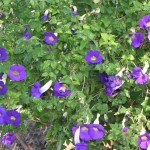 It produces tubular yellow-throated, deep purple flowers 2-3 in. across which may appear singly or in clusters. 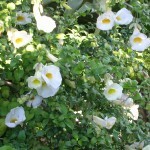 There is also a white flowering cultivar with similar growth habits as the purple variety. In addition to their beauty, the blooms are also mildly fragrant. Flowering occurs throughout the year, but most profusely in the summer months. The fast-growing Bush Clock Vine—‘vine’ being a misnomer borrowed from this species’ climbing relatives—makes an outstanding hedge for foundation plantings or borders. Left to its own devices, it will develop a sprawling habit, but it is very amenable to pruning. This desirable plant is also seldom affected by insect pests. 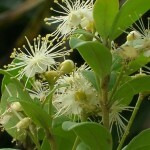 Myrcianthes fragrans (Simpson’s Stopper): This species commemorates Charles Torrey Simpson, botanist, conservationist and Sage of Biscayne Bay, for whom Simpson Park just south of downtown Miami is also named. 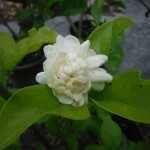 Its species name refers to the sweet aroma of the flowers, but the leaves also produce an aromatic smell when crushed. 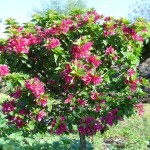 This stopper grows as a large shrub or small- to medium-sized tree with reddish peeling bark. It usually matures in the 10-20 ft. range, but 50 ft. is not unheard of in southern Florida. The growth rate is slow to moderate. M. fragrans is native from Lee, Okeechobee and St. Johns Counties southward through the Keys and into the West Indies, Mexico, Central America and South America. Leaves are 1-2½ in. long and semi-glossy on the upper surface. Dots on the leaf surfaces contain the aromatic substances which are released when the leaves are crushed. Simpson’s Stopper produces clusters of white flowers year-round, but most heavily during the spring and summer. The flowers are followed by orange to red globose berries that provide a food source to a variety of wildlife. The species is native to moist, well-drained limestone or sandy soils. Like the other stoppers, it does not like long exposures to salt air or salty or brackish water. Drought tolerance is moderate once a plant is established in a new site. For best results, grow Simpson’s Stopper in full sun to light shade.